No where in this post will I issue an apology. I am not sorry for what I'm about to share. And I think worse confessions can be made. I like cheesy love songs. Like, hold a radio over your head outside your window unfortunate kind of love that makes me unapologetic about loving love songs. I unabashedly tune into easy listening stations during a car ride and belt out every word to Michael Bolton or Air Supply. Sometimes, when I'm on my way home after a long night of GNOing, I turn to Delilah, in all of her chipper ridiculousness. I don't know what compels some humans to call in and share their dysfunctional life story with that woman, but boy am I glad because it usually means the opportunity to hear a long lost song by Selena or Jon Secada. Hubby often cringes at my taste in music, and we have very little overlap in our musical interests. 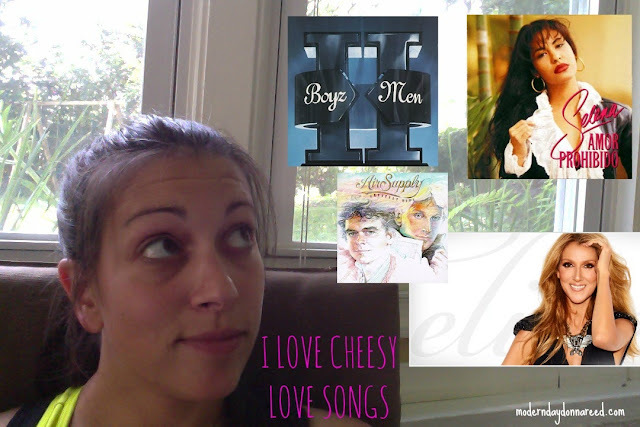 I'm not saying I listen exclusively to cheesy love songs. I'm just saying they are part of the rotation. And maybe I enjoy them more than the average human. Why do I love this kind of music? I don't know. But recently, I've hypothesized that deep inside every woman there is a 13-year old self that imagines her true love singing that song straight to her. During the song, she is whisked away to her own personal music video, full of romance, excitement and hope. Something in me secretly directs a mini movie every time I hear a love song. The angsty glances, the embraces on a beach, the unrequited love finally requited. These songs also make up part of my history. There was a time that I thought I would never tire of hearing Celine Dion's My Heart Will Go On. I hear Chris DeBurgh's Lady in Red, and I'm immediately at a middle school dance, complete with utter awkwardness. I hear Boyz II Men sing I'll Make Love to You and I am reminded why every kid who grew up in the 90's had a strangely unrealistic expectation for what intimacy would be like (spoiler alert: not like a Boyz II Men music video, people. That many candles is a fire hazard). Cheesy love songs are part of who I am. And I'm proud of that. So next time you see me driving in my car passionately lip-syncing to a song, you can guess what I might be listening to. What cheesy love songs do you hate to love but just can't help yourself? Leave a comment and share your Top Easy Listening Picks!